Wine is 85% Water By Volume (WBV). Water is essential to wine just as it is essential to life and making water available worldwide is Water For People’s mission. 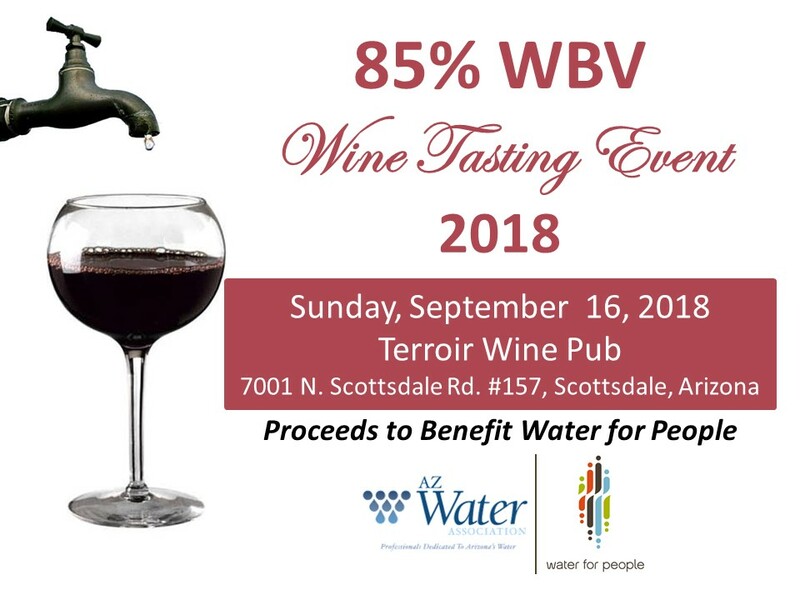 Please join us in celebrating and supporting Water For People’s mission at the 85% WBV Wine Tasting Event 2018 on September 16, 2018 from 1:00-5:00PM at Terroir Wine Pub in Scottsdale. Wine is 85% Water By Volume (WBV). Water is essential to wine just as it is essential to life. Making water available worldwide is Water for People’s mission. Please join us in celebrating and supporting Water For People’s mission at the 85% WBV Wine Tasting Event 2018 on September 16, 2018 at Terroir Wine Pub in Scottsdale. Wines of different varietals, both red and white, will be available for your sampling with small bites that pair with each wine. Bottles to enjoy at home will be available for purchase. A silent auction will be held at the event. If you would like to donate items for the silent auction, please contact Amy Baker (see Contact Information). Event admission is $35 per person, each attendee must be 21 years of age or older on the day of the event (September 16th). The event is limited to 100 attendees. If more than 100 registrations are received, the first 100 paid registrants will receive priority admission and the overflow will be reimbursed the admissions fees. Be sure to register now to secure your spot at this event! Click any of the Register links on this page!